The Yorkshire Terrier breed, in general, gets along very well with other dogs. However, bringing a second dog into the household does not come without some challenges. Things will work out far better if you prep in advance, have the right sort of introduction, and take steps to help both dogs feel comfortable with the presence of the other. The time to ask if your established dog will get along with another dog is before you actually obtain the second pet. While you cannot predict the behavior of a new puppy, you can try to learn your current dog’s tolerance level. This is done by introducing your established dog to a variety of other dogs. If you already know the size of the dog you are planning to bring into the house, try to have meetings and play dates with other dogs of similar size and age (toy, small, medium, or large breeds and puppy or adult). Where can you find a dog to help test this out? Look to neighbors, friends, family members, and co-workers. Even some time spend at your local dog park may help give you an idea. While the first one or two meetings should be outside on neutral territory, it is best to see how your established dog reacts to another dog while inside the home. This is because behavior can be radically different inside what a dog considered to be his territory. You’ll also want to think things through quite a bit if you have a senior dog. Many seniors, and particularly those with health issues, do best with peace and quiet. Having a new puppy bounding around the house, crawling on the senior, making all types of noise, and generally being revved up can be quite stressful for an older dog that prefers to spend his days resting. If you’re on the fence, and not sure if getting another dog is a good idea, there are some things to consider. It’s double the love. If having animals in your life that give you unconditional love is a big part of what makes you happy, expanding your household will bring you more joy. Companionship for the first dog. This is a ‘pro’ but with caution. With an established dog that seems fine on his own, and especially for older, senior dogs, there may not be a need for a canine friend. 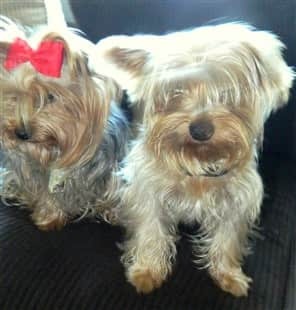 On the other hand, if your Yorkshire Terrier really struggles with being home alone despite taking all viable steps to cure separation anxiety, getting your dog a companion may work out for the best. Risk of incompatibility – There is no guarantee that a Yorkie will do well in the same household as another dog. Most do, but not all. This said, most squabbles do work themselves out. Double the cost – Please be sure to look at your budget realistically. This includes expected costs (food and supplies such as beds, grooming products including quality shampoo, coat sprays, and brushes, leashes, harnesses, dental chews, clothing, regular vet visits, and more). And this also includes unexpected costs including vet visits for injury or illness. Maybe you already have a Yorkshire Terrier and you wish to get him a playmate and companion, or maybe you have a different breed but want to add a Yorkie to your household. Either way, you are probably envisioning both dogs becoming best friends. While that is the ultimate goal, this is often something that takes time to develop. For this reason, it’s best to prepare the house so that each dog will have their own private spaces, and neither will feel overwhelmed. You’ll also want to have the right type of setup if you will be bringing home a new Yorkie puppy into a house with an older, well-trained dog. Maybe it’s been a while since you’ve guided a pup through the housebreaking and teething processes. 1. Fully puppy-proof the entire house, even if the new dog is an adult. Your current dog may know what is off limits and what is not, but some things may be dangers to a new dog. Remove any small objects from the floors, place shoes and other items up high (new dogs may chew on your belongings until they learn the rules), conceal or move cords, etc. 2. Use an indoor canine playpen. Playpens are fantastic for so many reasons. These are great to help with separation anxiety (helps create the feeling of a secure ‘den’ and keeps all of a Yorkie’s aid items right nearby), are a great tool to help contain a dog while house training, and keeps a Yorkie out of trouble when there is teething or chewing urges. There may be a time when both of your dogs like to share one playpen, and that is fine. But in the beginning, this offers both their own areas to retreat to when they feel the need. And, it will keep a new puppy safe if there is too much roughhousing. 3. Have separate bowls and planned separate eating areas. When it comes to food, most dogs like to have their own spaces. Eating side by side can cause dogs to feel as if their food is threatened. Both dogs can eat in the kitchen at the same time; but, have this be separate corners or areas that are at least 6 feet apart. 4. Have separate beds. 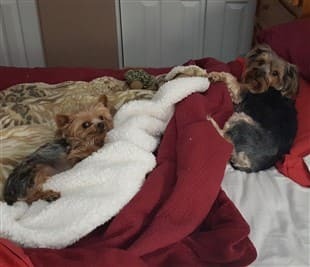 There are plenty of Yorkies that will cuddle up together, and even when you have a Yorkshire Terrier and a much larger dog they may sleep right near each other. However, when you first bring a new puppy or dog home, and particularly a puppy that may be waking up a lot at night, it is best if they have separate beds. For both, or at least for the puppy, this can be placed within the playpen. For these reasons, you may want to limit what you spend on the bed since it may be used just temporarily, instead of investing in a pricier memory foam mattress. Below are some of our recommended items that we’ve just covered, including some very helpful playpens, a nice bowl set, and a quality bed that is reasonably priced (do note that this is not memory foam). If you do not see the images, try a refresh. And on mobile, you may need to turn your screen horizontal to see all 4. Hopefully, you have already tested your established dog to see if he tolerates other dogs, and you have prepared the house by creating separate areas for each dog (at least for now). And, the big day has now arrived. 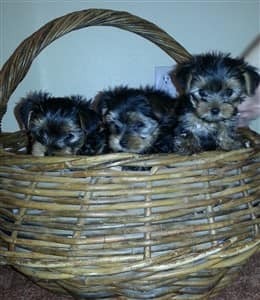 Your Yorkshire Terrier is about to have a new friend (maybe it’s another Yorkie, or it could be another breed all together), or your current dog is about to have a new Yorkie puppy as a brother or sister. 1. Have the playpen, food and water bowls, and all other care items in place. 2. Only have immediate family present. While this is an exciting time, meeting too many people can be very overwhelming for a new dog. Extended family, friends, and neighbors can greet your new puppy or dog at a later time once he’s settled in. 3. Do not keep handing the new puppy off to people. It’s hard to resist the urge to pick up and hug a new puppy. But, right now, the goal is an introduction to the home and too much handling can be stressful. Each person should knee/bend to great the puppy and say hello. Long snuggles can come later. 4. Have both dogs on leash. As always, we recommend leash and harness (not collar) to help prevent neck injury including the very serious collapsed trachea. When two dogs meet, there may be some jumping and other quick movements, so a harness is the safest way to go. A good harness for this breed is the Lil Pals Mesh Comfort Mesh Adjustable Harness , which comes in sizes extra small, is very comfortable, and is easy to put on. 5. Have the established dog first meet the new dog outside the house, in the yard but not close to the front door. This will help avoid a sudden ‘intrusion’ of the current dog’s territory. 6. Allow the dogs to sniff each other. This is the standard canine ‘hello’, and is an important part of dogs understanding who the other is. Scent glands relay information including gender, health status, and even mood. 7. Never force interaction. Let the dogs go about this at their own pace. 8. Lead the new puppy through each room of the house, allowing him to explore/sniff as he wishes. Stop near the bed, the toy area, and where the food and water bowls are, taking time to say the words of what these are (i.e. ‘bed’, ‘water’, etc.) This should be repeated several times per day for the first few weeks. 9. Lead the new puppy to the yard, and walk along the perimeter. 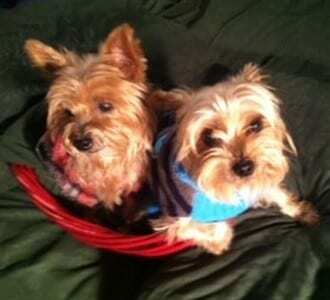 Some Yorkies will greet a new dog and instantly take to them, becoming best friends in the blink of an eye. This said, that does not always happen. It normal for both dogs to take time to feel each other out and several weeks to fully get used to the other. During this transition, there may be a mix of curiosity and surprisingly, disinterest at times. An older dog may take the initiative to put a younger dog in his place. Do allow this to some extent as long as the smaller one is not being hurt; it’s the canine way. However, you’ll want to supervise things and intervene if needed. If you have a Yorkshire Terrier that appears scared of a new dog in the house, this is a clear sign that there’s an innate fear of other dogs (either in general or once the territory is ‘invaded’); This is something that should have been tested before making this type of change to the household. While some care tasks will remain the same such as giving each dog a bath once every three weeks, taking care of at-home dental care, and brushing the coat on a regular basis, other needs may vary. One is exercise. If your dogs have wide gaps in age, their daily exercise requirements may vary. A young pup that is overly hyper may do best with 3 walks per day to help him release pent up energy. An older dog may do best with 2 daily walks. Another is feeding times. Due to risk of hypoglycemia (rapid drop in blood sugar levels), most young pups do best with 3 to 4 small meals per day, plus snacks (best reserved to reward good behavior). But many adult Yorkies eat 2 to 3 meals per day, plus snacks. Their servings will vary too, of course. The guidelines for most kibble is based on weight. Finally, one-on-one time may vary. An established adult will have a routine, and may enjoy relaxing with you on the sofa or maybe sitting by your side while you garden. But, a puppy will need time with you in regard to training, both housebreaking and commands. So, while there will be times when you’ll all be together, there may also be windows of time that you’ll want to devote to each dog individually. 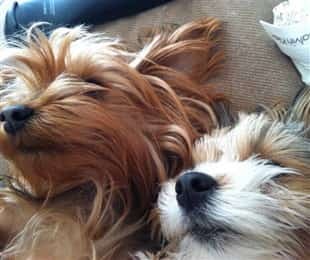 Having two Yorkies, an older Yorkie and a new puppy of another breed, or another dog alongside a new Yorkshire Terrier puppy often brings about certain issues. Here we will cover some of the most common hiccups and how to deal with them. My dog started marking when the new puppy came into the house. This is not uncommon. Until the two dogs get used to each other, the presence of a new dog can trigger territorial marking. Unfortunately, without intervention, marking may continue indefinitely if the dogs are competing to be an ‘Alpha’ (the leader among the dogs). Some things that can help with marking is to have both dogs fixed. Dogs that are spayed or neutered mark much less frequently than those that are not. You’ll also want to clean any marked areas with a quality enzyme cleanser like Sunny & Honey's Pet Stain & Odor Miracle Enzyme Cleaner . This is because regular soap does not remove lingering scents that often lead a dog to repeat soiling of the area. Supervising the dogs in order to interrupt this sort of behavior, and not allowing access to every room in the house is vital. This is another time when a canine playpen can be very handy. Finally, helping the two dogs figure out which one is Alpha can put this dispute to rest (more ahead). My new young puppy is bothering my older dog. This is a common scenario. Older dogs often have trouble tolerating high energy pups. And it’s really not fair to expose an older dog to constant jumping, romping, and the general disorder that surrounds a hyper young pup. For this reason, the older dog should be able to retreat any time he wishes. Having a playpen with a door for the older dog is a good method to resolve this. And you’ll want to place this in a quiet area of the home, but not completely isolated. When you are home, you can close the door to the pen once your older dog has made his way there. For times that you are not home, keep both dogs in their own pens. Be sure to carefully choose some engaging toys that will help keep the pup busy and distracted. Those that react to his movements or speak like the Pet Qwerks Animal Sounds Babble Ball can be a lot more fun than pestering your older dog. Harassment will generally resolve with time as the pup matures and calms down, and the older dog gets accustomed to the new one. My young puppy is nipping at my other dog. Young pups, and especially those that are teething, may have not learned all of the rules yet and/or teething pain may cause some lack of self-control. When there is a litter of pups, there is a lot of nipping going on. When a nip is too hard, the offender is temporarily ‘banished’ from the pack. The time out should last 10 minutes past the point of the pup noticing that he’s being ignored (many are a bit oblivious, so it can take a little while). Once released, the pup will be allowed to prove himself. Good behavior allows him to be part of the pack again. Another nip equals another timeout. Most pups learn rather quickly, since the threat of banishment sends a very loud message. Will my new puppy learn housebreaking from my older dog? 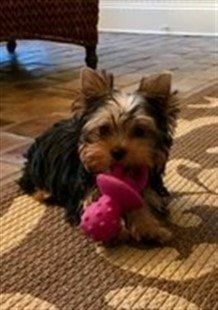 Having your established Yorkie house trained, or having another dog well trained when bringing home a new Yorkie puppy will certain help to some extent; young pups often mimic behavior of older dogs. However, your current dog cannot be the sole source of potty training a puppy. You will still need to implement all housebreaking rules. This includes choosing a designated area, bringing your pup there to supervise, using rewards as motivation, taking your pup out often enough, and properly cleaning any accidents. Can an untrained puppy cause my dog to forget his house training? If the arrival of a new puppy causes an older dog to start having accidents, if this is just urine, this is often a case of marking (see above). However, in some cases, if strict housebreaking is not enforced for the new puppy, it may slacken for the older dog as well. For this reason, be strict about following all of the rules, and give rewards to your older dog as well; it’s always a good idea to reinforce good behavior and remind an older dog that he’s doing great by going to the bathroom in a designated area. Does one dog have to be the Alpha? Not necessarily. But first, let’s summarize what the Alpha is. In the eyes of a canine, there is a hierarchal order to things. This holds true for all breeds, both large dogs like Huskies and tiny dogs like the Yorkshire Terrier. Within the den (house) there lives the pack (all humans and animals). There is a leader (the Alpha, which should be the human owner, but some dogs can have trouble with this) that oversees the Betas. And within the subset of dogs, there may be an Alpha Dog (leader of the dog pack). 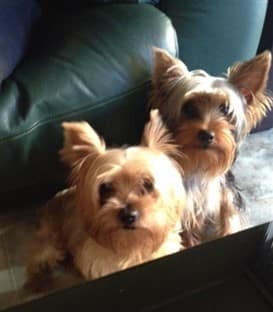 If you have two Yorkshire Terriers that are very close in age, and often if they are the same gender, AND you have clearly established yourself as leader (more ahead), they may both see themselves as equal Betas under your command. If this case, there may be no need for an Alpha Dog. If you have dogs that are different ages and/or dogs of different genders, they may indeed see the need for one to take an Alpha position. And, they may fight for this ranking, which often causes trouble and in some cases aggression. How do I make it clear I am the Alpha? All dogs should obey a ‘sit’ before any meal, snack, or new toy is given. All dogs should obey a ‘sit’ before their leash is connected to their harnesses. When leaving the house, you should exit first, followed by the dogs. This order should be repeated when coming back inside. Never allow your Yorkie to walk ahead of you while out on walks. Your dog’s place is in a heeling position (to your left side). Having your Yorkie on harness and with a short leash (handle in your right hand, left hand holding a section of the leash to the side of your left leg) will help you control your dog’s positioning and pace. How do I help both of my dogs figure out who is the Alpha dog? If there is a need for an Alpha (both dogs are not happy being Betas under you), most dogs figure this out on their own. It is normally the older dog. If the dogs are close in age, but seem to be testing each other, it may be the male over the female. Typically, one dog will be trying harder than the other, and this can be a good clue as well. Once you see which dog should be the leader of the two, you can help by setting the Alpha’s bowl down first (food is one of the strongest symbols in many respects), and essentially having the Alpha be first for anything of importance (having the leash put on, being given toys, etc.). 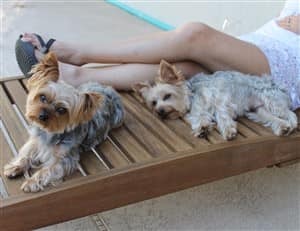 One of my Yorkies is hyper, the other is calm. The hyper one's barking sets my other dog off. This can be tricky, but of course needs to be addressed, since one barking dog can drive you up a wall, so having two go crazy can test the limits of even the most patient person. 1. See if you can identify the triggers for the one that starts the barking. Is the dog looking out of the window at the neighbors? Or birds out in the back yard? If so, close the blinds. Is the first barker bored? Not all dogs will be happy enough just with each other's company; dogs in multiple households also need to have fun toys. 2. If you've taken care to address triggers, it'll be time to interrupt the behavior, since dogs can bark for quite a while until they finally physically wear out. One ethical way to do this is to use a behavior interrupter. It is a bit like a hand clap to gain a dog's attention, but generally works much better. One like the The Company of Animals Pet Corrector emits a short hissing noise. It is a particular hiss that is very effective to make a dog take pause. Once you've achieved that pause, refocus your dogs. This may mean offering a 'new' toy (hide 1/2 of all toys in order to rotate them out), go through some commands (sit, down, etc.) and give reward for doing so, or turn on some music... a CD specifically to calm dogs down like The Divinity of Dogs- Music to Calm Dogs and the People Who Love Them may be a good choice. Bringing a new puppy or dog into a household with an established dog should never be taken lightly. All members of the household should be on board, this should align with your budget, and it’ll be important for you to take your current dog’s needs into strong consideration. 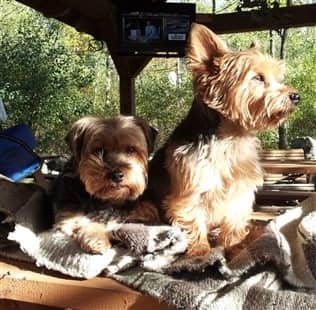 This said, there is nothing cuter than seeing two Yorkies cuddled up with each other, or a little Yorkie getting along well with a big brother or sister. If you plan, prepare, and take steps to help both dogs adjust, you’ll be able to get past any hiccups and create a calm, happy household. Best Brushes for a Yorkshire Terrier - The grooming tools that you use will play a huge role in coat health and appearance. Traveling with a Yorkie - Guidelines for safe, comfortable travel with reduced motion sickness. Best Carry Methods for a Yorkie - One of the great things about having a Yorkshire Terrier is his size; but, Yorkies also cannot walk as fast or as far as you. See some great ideas for when you want to take your Yorkie along to places that involve a lot of walking.